Business decisions, as many of our colleagues in business and your own experience can attest, are frequently based on hope or fear, what others seem to be doing, what senior leaders have done and believe has worked in the past, and their clearly held ideologies—in short, on lots of things other than facts…If doctors practiced medicine the way many companies practice management, there would be far more sick and dead patients, and many more doctors would be in jail. We cannot know how well we’re performing without evidence of what’s going on and what works. To improve performance, we must measure it. Relatively few organizations can prove that they’re performing well, but they certainly spin great yarns trying to convince us and even themselves. 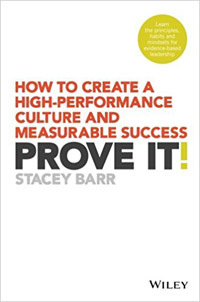 According to Stacey Barr, high-performance organizations can prove their success with facts. In her efforts to help organizations enter the realm of high performance, she has written a new book to make the case for evidence-based leadership titled Prove It! How to Create a High-Performance Culture and Measurable Success. Almost any organisation can prove that it does things. It can prove that it hires people, that those people carry out different tasks, and that money is earned and spent. But what many organisations cannot prove is the most important thing: whether they are fulfilling their purpose or not. High-performance organisations don’t just do stuff. They have an impact—ideally, the impact they exist to make. And they can prove how much impact they create. She doesn’t just make the case for evidence-based leadership, but also explains in concise, clear, and readable prose how to achieve it. This book is short, sweet, and practical. It is also incredibly smart. If you are an information worker, but are frustrated because you work in an organization that doesn’t base its decisions on evidence, despite what it claims, this is the book that you should place in the hands of your organization’s leaders. Let Stacey Barr make the case for organizational improvement through better evidence-based leadership for you. Without buy-in from your executives, you don’t have a chance.